We have 2 litters now and are expecting one more! 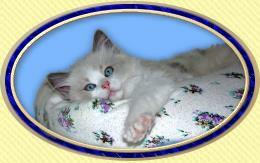 Lottarags is a small Ragdoll cattery located just north of Boston in Billerica, MA. 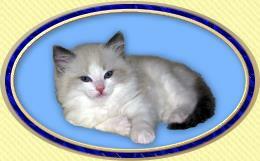 We raise our Ragdoll kittens for excellence in beauty, the best in health and temperament. 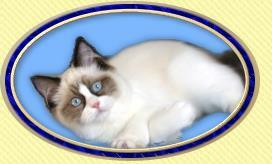 I am a Ragdoll breeder in Massachusetts as well as a Registered Nurse with 30 years of experience in pediatric nursing. My nursing expertise is ideal for breeding as I have been trained to be a keen observer of subtle changes in the condition of patients. 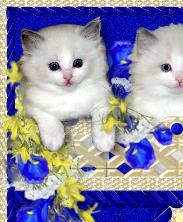 This training enables me to better care for my Ragdoll queens and their kittens. I know the importance of a clean environment and am constantly cleaning and disinfecting to provide the most hygienic condition possible here at Lottarags. 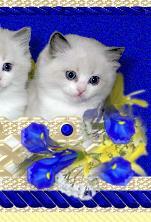 We have Ragdoll kittens available in MA for adoption throughtout the year. I show our Ragdolls mostly in CFA and strive to produce kittens that adhere as closely as possible to the Ragdoll standard. I am very proud of my show accomplishments having achieved 5 Regional Winners and 4 National Ragdoll Breed Winners in CFA. I have shown in TICA as well receiving Regional recognition for my Supreme Grand Champion Von Faxon. For more show results please visit our show page. A Ragdoll is a large long-haired man made breed that originated in California over 50 years ago. Although the specific origin is often confused or misinterpreted, it is known that the original breeding included a long-haired cat with a pointed blue eyed breed. Ragdolls come in many colors and patterns with the common characteristic being their excellent temperament and their exceptionally soft easy maintenance coats which is not typical of long-haired cats. Males range from 12 - 18 pounds and females about 8 -12 pounds. Ragdolls get along well in most homes with children and other pets. They truly adore their humans by how they greet and follow you everywhere. Please enjoy our website and visit often as we update frequently. Feel free to contact me for more information at (lottarags@mac.com) Thank you!